All Israeli settlers in the now occupied territories will return to Israel. West Jerusalem will be the capital of Israel. and will accept, in principle, the right of return. The refugees will be offered several possible venues of rehabilitation and compensation. based on a formula that will maintain the Jewish majority in the state of Israel. a formula which can be accepted by the majority of the Israeli and Palestinian peoples. 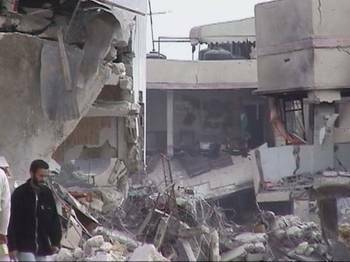 In the last weeks, The israeli army has launched a rampage into the town of Beit Hanoun. in an attempt to stop the launch of primitive rockets in the direction of Israel. We will try to update this page as often as we recieve information and images. and the chiefs of the Mossad and the Security Service. of clowns and delinquents who have taken over the Knesset. continue the occupation and prevent the establishment of the State of Palestine. Sharon & Co. invited violence - and violence we got. Anyone who believes that Sharon would bring peace will believe anything. and war follows him wherever he goes. 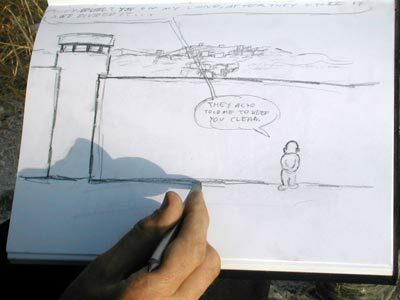 Update - Mas'ha 07/06 + more picturesThe cartoon says: "They also told me to keep you clean"
"A Wall in their Heart"
An elaborate article on the wall, published in "Yediot Aharonot", Israel's largest paper. "but their fears are no greater than the fears of the residents of Tzur Yigal."..." The Separation Fence Will Hurt Palestinians Immensely. An article on the World Bank report. 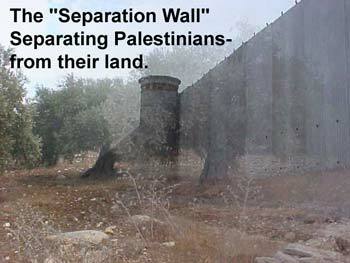 The "Separation Wall" is not meant to separate Palestinians from Israelis. It is not even meant to provide security for the Israeli citizens. So, What is the real purpose of the wall? "I was a Human Shield"
was reason for Billie Moskona-Lerman to go to the Rafah Refugee Camp and to spend 24 hours at the most miserable place in the Gaza Strip. the walls are covered with bloodstains on the walls, houses turn into ruins and people walk the streets barefooted and desperate. She came back a different person. In a rare human document she describes her encounter with death. giving a glimpse of Palestinian daily life which is very rare in the mainstream Israeli press. # Solo performance. If there had been a printed program, it would have looked something like this: "Peace in the Holy Land" by George W. Bush. # What makes George run? Why this sudden enthusiasm for personal intervention in the Israeli-Palestinian conflict? The Ayalon - Nusseibeh "Peoples' Voice"
The Ayalon-Nusseibeh project known as "the Peoples' Voice"
the Pew Research Center for the People and the Press released a study titled, "What the World Thinks in 2002." examines how the global community perceives the United States. as it showed that positive attitudes toward the United States had plummeted since the election of the Bush administration. The study, discussed in greater detail in "Fanning the flames of resentment,"
found that in 19 of the 27 countries polled, attitudes toward the United States had shifted dramatically. From Western Europe to Latin America, genuine anger toward the United States was sharply increasing. many Muslims believed, and still do, that the "war on terrorism" is actually a "war on Islam." Do not commit war crimes! War crimes will haunt you all your life, anywhere on Earth. who are here to help and witness. on what actually happened in Jenin. an interview with one of those who did it and are proud of it. Israel's most widely circulated tabloid paper, on May 31, 2002.
this is also a startling human document. Caterpillar heavy bulldozers to the Israeli army. 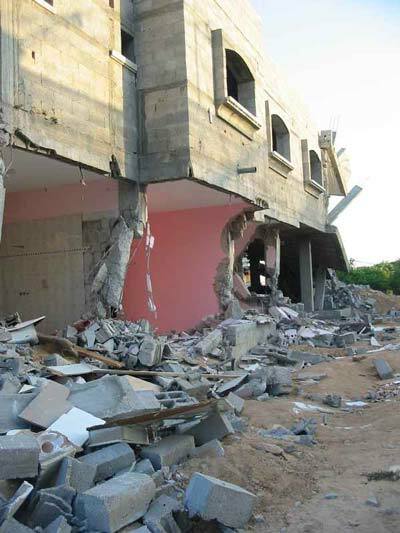 for wide scale demolition of Palestinian homes. A Flash Presentation of Barak's "Generous Offers". Elaborate reports, articles and pictures, describing damage and vandalism by the Israeli army, to civil institutes throughout the West-bank. See for yourself if this is a "war against terror", or something completely different. We are interested in more material, especially photos. Pictures of graffiti of threats and hate. An example of a Jewish response to Kawther's story. on Monday, July 29, she crossed the Alenby Bridge to Jordan. "The Daily Life of Kawther Salam"